In most situations we’re used to cabling being hidden in walls or under floors, but there are circumstances when there’s no alternative but to run it on the surface. In which case, the answer is to use trunking to keep things tidy and safe. It sounds simple enough, but there is an almost bewildering variety of types and sizes of trunking on the market, so you need to take your time to ensure you make the correct choice. Getting the best cable management solution for a particular installation is a matter of understanding what’s required and that means asking the right questions. • What type of cabling is the installation for? • Do you need to accommodate different types — power and data, for example? • Do you need to fit sockets in the trunking itself? • How much allowance do you need to make for expansion? • Does your cable have a minimum bend radius? • Is a specific colour required to fit in with décor or match an existing installation? Let’s look at some of these requirements in more detail. The type of cabling is one of the most important factors. When installing cabling you need to allow a space factor to avoid overheating. 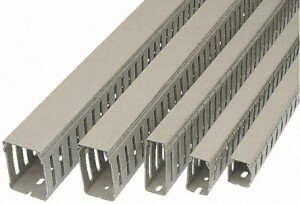 This means that not more than 45 per cent of the space in the trunking can be occupied by cabling. For data and telephone cabling – most installations will use the same CAT-5 or CAT-6 cable for both of these – the space requirement still applies and you need to take account of this if adding extra cables in the future. However, you’ll need to use compartmentalised trunking if you intend to mix power and data cables in the same trunking. You can find more detail on the requirements of network and data cabling here. Allowing room for expansion is always a good idea as installations seldom stand still. Specifying trunking that’s slightly larger than you think you will need can save a lot of problems further down the line. The kind of trunking you need will vary according to the needs of the installation. Online wholesalers like RS Components and Premier Farnell stock a wide array of trunking cables and produc info available on their pages could guide prospective customers. To start with a good example, you can take a look at the trunking cable options at RS. Metal trunking tends to be used in industrial environments, outdoor installations or places where it’s not seen. PVC is a more common choice in office environments. Where some flexibility is required there’s also the option of chain trunking, which protects the cable but still allows for some movement. Skirting trunking is common in commercial premises such as offices and laboratories along with surface-mounted mini-trunking, which can also be used in domestic situations. Segregation of cables can be achieved with multi-compartment trunking, but note that metal trunking will be needed if shielding is required between the different types. Because of the many different types available, trunking is a versatile option for cable installations. By taking the time to plan what you need and select the right materials for the job, you’ll ensure a neat and long-lasting result.